The Royal Audit Authority, in its annual report to the Parliament, pointed out what we all know: that both our political parties are in serious financial problems. As of 30th June 2008, PDP owed Nu 20,326,924 to the Bank of Bhutan and Nu 3,588,232 to other various other suppliers. DPT owed Nu 14,253,975 to the Bank and Nu 7,708,010 to other suppliers. Yesterday, the National Assembly spent a good hour discussing the Royal Audit Authority’s observations on the financial status of our two political parties. Actually, we did not really discuss the audit observations per se. Instead, we talked about, at length and in great detail, the need to provide state funding for the political parties. This is not good. During our first session, about a year ago, we’d debated state funding for political parties. And we’d agreed that it would be unconstitutional. In fact, the Chief Justice, who at that time was still the Chairman of the Constitution Drafting Committee, publicly declared that state funding for political parties would be unconstitutional. But still, we discussed the issue again. Some of the arguments our honourable members of parliament, including ministers, presented were shocking. Most of the members proclaimed that, upon closer examination, the Constitution did not specifically prohibit state funding for political parties. Many suggested that the foundations of our democracy would crumble if the existing parties were to fail. Some threatened that political parties, especially a ruling party with a huge mandate, would resort to corrupt means to raise funds. And, one brave member even proposed that laws could be amended to allow state funding. My views are simple and straightforward. According to Article 15.4(d) of the Constitution, a political party can be registered if, among other things, “It does not accept money or any assistance other than those contributions made by its registered members, and the amount or value shall be fixed by the Election Commission.” Furthermore, the Election Act clearly specifies that political parties can raise funds from only three sources: registration fees, annual membership fees, and voluntary contributions. So obviously, I cannot support any proposal for state funding for political parties. But what if one or both the existing parties were to collapse? Wouldn’t that affect democracy? Yes. But the show, so to speak, would go on. The importance of the existing parties is overrated. They are not indispensable for our democracy. Should they fail, it would be most inconvenient, and embarrassing, but other parties would surely come forward. And, they wouldn’t make the same mistakes, especially the excesses that have caused both PDP and DPT financial woes. Now, if politicians, on the other hand, are prepared to knowingly violate the Constitution, we should be scared. It is dangerous for democracy. And it must not be allowed to happen. Incidentally, less than a month ago, I’d expressed my concerns that our government may try to justify state funding for political parties (read Financing parties). Today we organized a special meeting for our financial supporters. During the meeting, we made presentations on the status of our party, and talked about the way forward. Our supporters resolved that the PDP must continued to be strengthened in order to provide an effective opposition to the government, and to ensure that our people have access to a credible alternate party. Several supporters offered voluntary financial contributions. Others volunteered to join the fund-raising committee. Yesterday, our secretary general Sonam Jatso and I visited Punakha. 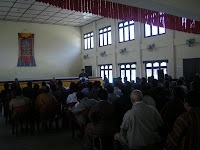 The PDP Dzongkhag office there had invited us to attend their general meeting. About 100 party members including members, workers and supporters had gathered to discuss strategies to further strengthen our dzongkhag office. I was delighted. We lost both the Punakha constituencies last year. And our president, Lyonpo Sangay Ngedup, who hails from Punakha, resigned to take moral responsibility for the poor election results. Yet, not a single party worker or supporter has left the party. Instead, they are closer and more focused than ever. And they are determined to work hard to revitalize our party. Last week, in a quiet ceremony, Lam Kezang Chhoephel, PDP’s secretary general, formally handed over the party’s files to the incoming secretary general, Sonam Jatso. Lam Kezang joined PDP in July 2007 and served as the party’s first secretary general. He successfully registered PDP as Bhutan’s first political party on 1st September 2007, and was instrumental in establishing and developing PDP’s party offices throughout the country. Lam Kezang leaves the PDP to join a private company. I thank him from the bottom of my heart. And I wish him success. The fact of the matter is that all democracies are based on, more or less, the same principles, and none can claim to be really unique. But, on the other hand, no two democracies are exactly the same, making every democracy, unique in its own way. So to claim that our particular form of democracy is unique, in the way it is structured for example, would not make much sense. But in one regard we are unique, and in another we must aspire to be so. We are truly unique in the way democracy was introduced in our country – gifted, so to speak, from the Golden Throne to the people. This, we must never forget. And always celebrate. And we must aspire to be unique in another way: in the quality of politicians that we elect. In every democracy, politicians are viewed with suspicion. They are considered, and many times proven, to be a greedy, corrupt and power-hungry lot who will go to any length to win, but who, once elected, can’t be trusted to keep their promises. Why do I remember Sherubtse? Because today, 24th March, is exactly one year since we elected 47 people to the National Assembly. So it is a fitting time to reflect if we, politicians, are fulfilling His Majesty’s vision for a vibrant and honest democracy. And to see if we, politicians, are living up to the hopes and aspirations of our people. To consider if our politicians are unique. One politician has already proven that he is unique. Lyonpo Sangay Ngedup may have lost the elections last year, but, by all accounts, he has become even more popular. Yet, in spite of his growing popularity and the strong appeals from all over our country, he resigned as PDP’s president. And he resigned for one reason alone: to take full moral responsibility for his party’s loss in the general elections last year. Now that, in Bhutan’s context, is unique. And should be emulated by our politicians. Perhaps then, we can claim to have a truly unique democracy. The PDP held its second general convention yesterday. Despite strong appeals, from every party member, PDP president Lyonpo Sangay Ngedup resigned, taking full “moral responsibility” for the party’s loss in Bhutan’s first general elections. The general convention also approved a new executive board. Tomorrow, 22nd March, PDP will hold its general convention. We anticipate a large turnout. People from every dzongkhag have telephoned to inform us that they’ll be participating in the meeting. The convention is open to all party members. To attend, please be at the RAPA hall by 9:30 AM.